These initiatives at The Children’s Hospital at Montefiore (CHAM) and Montefiore’s other campuses, help promote well-being among patients, family members and associates by reducing stressors such as noise, glare and clutter; connecting patients and associates to nature; offering beauty and positive distraction through visual art; and providing space and seating layouts that encourage visitation by family and friends. All these elements are known to have an important effect on people’s feelings of wellness and ease in a physical environment. CHAM was specifically designed to provide a healing and aesthetic setting for pediatric care. 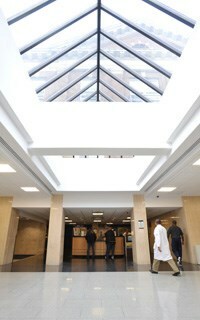 Moses Campus Lobby—The entrance lobby on East 210th Street has been transformed into a more communal and welcoming space, with a new coffee shop, larger waiting area, easier access to the second floor, and skylight. East-West Courtyard and Gardens—A place for associates and visitors to sit outdoors amidst plants and flower beds. Caregiver Support Center—A tranquil refuge for family caregivers to relax and receive support, with a special sound system to play gentle music and a water wall. Multi-Faith Chapel—A quiet space to find refuge and peace, with stained glass windows and wooden pews. Northwest 7 Meditation Room—A quiet, private space for Palliative Care/Inpatient Family Medicine care providers and staff to relax and de-stress. All patient beds are being replaced. 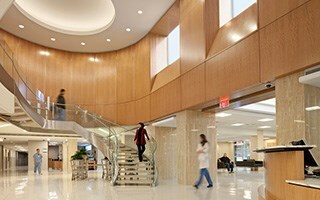 Medical Arts Pavilion Lobby—The lobby and waiting area have been converted into warmer and more welcoming spaces, including a new coffee shop. Tishman Conference Center—New professional meeting and event spaces with state-of-the-art conferencing capabilities. Einstein Campus Lobby—The entrance lobby has been transformed into a more communal and welcoming space, with a new coffee shop and larger waiting area. New Ophthalmology and Orthopedics Outpatient Clinics—Two new clinics designed to maximize patient comfort in the clinical care environment. Via Verde Health Center—A new 5,000-square-foot Montefiore Medical Group site in the South Bronx that is located on the ground floor of Via Verde, an affordable housing complex that has received national attention for its innovative and eco-friendly design. 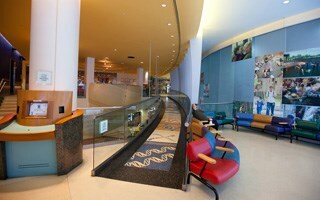 Center for Child Health and Resiliency at the South Bronx Health Center—A new health center designed with colorful design elements to be a comfortable and playful space for children and families.